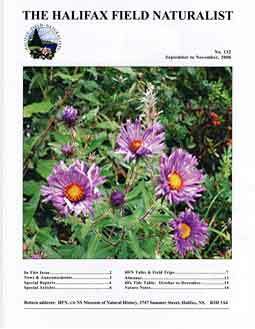 The Halifax Field Naturalist is our newsletter, published quarterly since 1975. Recent issues have been about 20 pages (8.5 x 11″) long with a full colour cover. Each issue includes News and Announcements, Special Reports, summaries of Talks, reports on Field Trips (with species lists), an Almanac and Tide Tables for the ensuing 3 months, and Nature Notes from recent HFN meetings. Click on the image above to view a recent issue in PDF format. Members of HFN receive a print copy of the newsletter. Older issues right back to the first issue in 1975, except for the most recent three years, are available and searchable online via the link to Archived Newsletters at right.